You are here: Home / Uncategorized / New Market, Soon-To-Be Old Waterfront? The New Market Building in the South Street Seaport, which preservationists want saved, the City wants demolished, and CB1 wants set said as the site for new civic amenities. 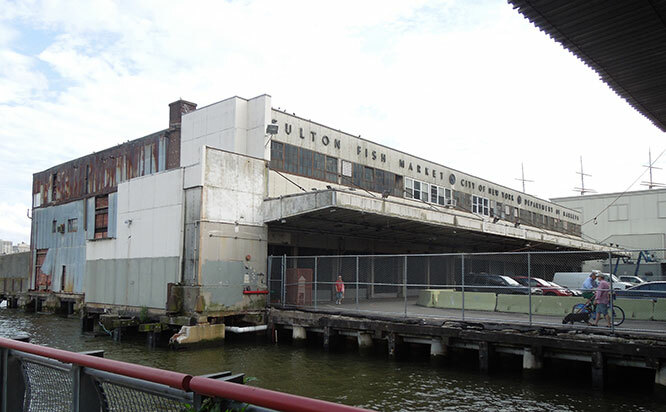 Local leaders are beginning to incubate ideas about what to do with the site of the New Market Building, the historic 1939 structure in the South Street Seaport that is slated to be razed later this year, as a result of its dilapidated condition. The site has been a focus of controversy in recent years. In 2013, the Howard Hughes Corporation, which has been designated by the City to redevelop the South Street Seaport, announced plans to demolish the structure and erect a 60-story residential tower there. This plan inspired bitter opposition among preservationists, community leaders, and elected officials, which eventually scuttled to proposal. Even with the planned skyscraper’s cancellation, however, the New Market building has long faced an uncertain future. Decades of neglect have compromised the structure, raising the prospect that it may collapse. Weighed against this are what many preservationists see as the structure’s enormous historic value. It is listed in both State and Federal registers of historic sites, but does not enjoy City landmark status. In fact, the border of the City’s South Street Seaport Historic District saw-tooths around the New Market Building, leaving it legally unprotected from demolition. Possibly eclipsing such considerations is the deck and pilings beneath the structure, which are arguably in worse disrepair than the New Market Building itself. This supporting framework has been deteriorating since the 1970s, and even if the building above were in perfect condition, it would still be in danger of falling into the East River as the substructure collapsed. Repairing this deck is estimated to cost millions of dollars. But, as Mr. Goldstein noted, the City has not allocated any budget for such as project. This seems to imply that a private-sector benefactor will be needed to enable any kind of redevelopment at the site of the New Market Building. In its original proposal for a residential tower, the Howard Hughes Corporation offered to cover the cost of such a repair. With an area of nearly 40,000 square feet, or almost one acre, the deck makes an attractive prospect for any developer. Whether the parcel will be developed for private profit, community benefit, or some combination of the two — or whether it will remain empty after the New Market Building is dismantled — remains to be seen. All of these considerations may be rendered moot (or at least vastly more complicated) by the plan, recently announced by Mayor Bill de Blasio, to use landfill to extend the East River shoreline, between the Brooklyn Bridge and the Battery, as a resiliency measure. If this plan moves forward, the site of the New Market Building may end up being two blocks inland from the new waterfront.